Autumn is well and truly underway, so I’m a little late in posting this autumn wish list, but it’s never too late to shop some of my favourite pieces from this season. I’m definitely not a cold weather person, but I do love this season for the autumn fashion. The big coats and snuggly jumpers are very much my sort of thing, and not to mention the thigh-high boot trend! That trend seems to come around each year, and still look as amazing as the year before. 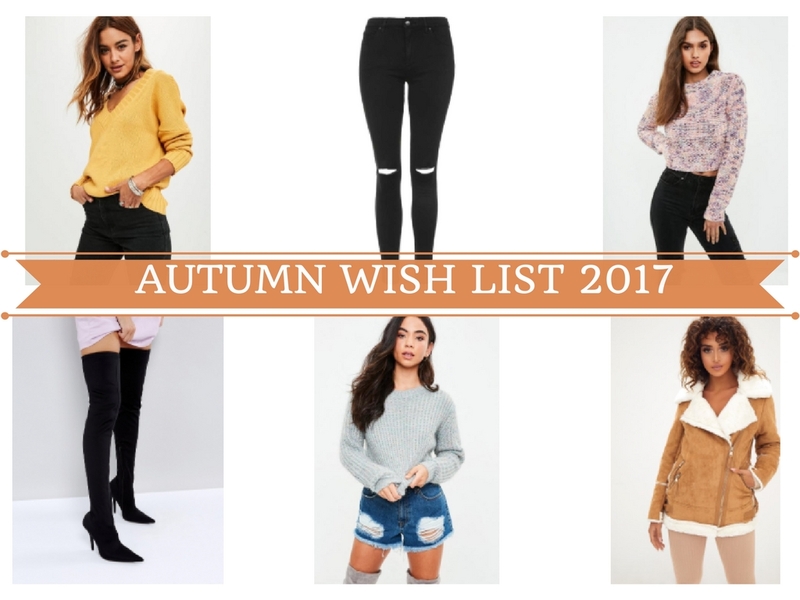 The fashion is definitely my favourite part about autumn, and putting together this wish list was super fun and easy, as there are SO many gorgeous pieces out there at the moment. A lot of brands have also really stepped up their game recently, which is great to see! As it’s getting colder outside, I decided to include a few warm coats, which are a must-have for this time of year – especially with winter coming up! Puffer jackets are huge right now (literally), and they look really warm, so I had to add one to my wish list, along with fluffy teddy bear coats. They are definitely at the top of my wish list, along with a mustard jumper – they just scream autumn! Fluffy jumpers are a definite favourite of mine, so I added quite a few that I’m loving at the moment, as well as some ripped jeans and boots. Have you bought anything this autumn that you’ve been loving, or have you seen anything on this wish list that you’d want to buy? As much as I love creating these wish lists, my bank account certainly doesn’t, because I literally want everything on this list, and probably a lot more as well..!